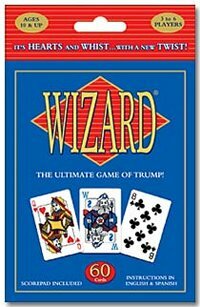 Wizard is a unique card game with a 60-card deck that is challenging, surprising...and truly habit-forming! The rules are simple and easy to learn--mastering the strategy is the real challenge. Players bid the exact number of tricks they expect to win each round. Complete with Wizard and Jester cards, and a special scorepad, Wizard is so much more than your average deck of cards! Other products in the "Wizard" series. Nice trick-taking game. Especially the "reverse" joker that let's you get out of (almost) any trick is a nice feature.